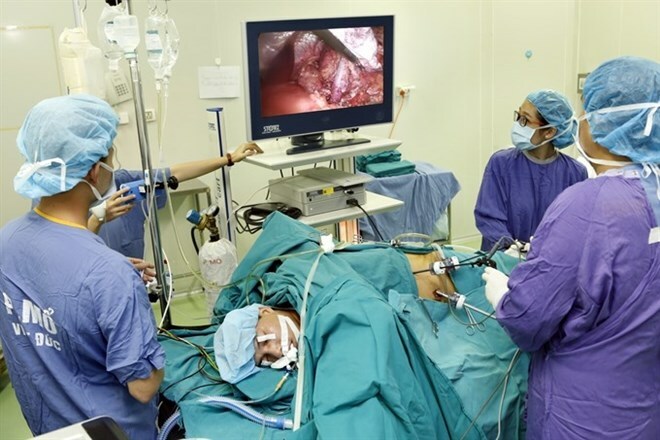 Hanoi (VNS/VNA) - For the first time in Vietnam, doctors at the Vietnam-Germany Hospital have successfully performed a split liver transplant, dividing a donor’s liver and transplanting it to one adult and one child patient. Doctor Nguyen Quang Nghia, head of the hospital’s Organ Transplantation Centre, said the most complex aspect of the liver transplant was that medical staff had to split the donor’s liver and then transplant it into one child aged eight (was suffering liver failure - hepatic coma due to decompensated cirrhosis, as well as copper metabolism disorder and congenital biliary atresia), and a 49-year-old adult with liver cancer. Professor Tran Binh Giang, director of the hospital, said the success of the split liver transplant affirmed the professionalism of local medical staff and offered a new opportunity for patients waiting for liver transplants. At present, the source of livers for transplant remains limited, mainly from brain-dead donors, but with the split liver procedures, one donated liver could help two patients, he said.